Republican budget cuts declare war on Americans – who voted for them? Which means that if, you are making $60,600 dollars a year right now – you are actually only making something less than $33,400 dollars in 1988 money and what it could buy, based on the consumer price index. But, it would take $63,300 a year to have the same amount based on a consumer bundle of goods. And, to have the same amount as $33,400 represented in 1988 of the US GDP – it would take a salary of $92,500 dollars a couple years ago (2009) – this year and last year it would’ve been even worse, requiring a great deal more than that to have the same $33,400 dollar worth of real financial value. $171,000 dollars a year salary in 2009. But, our legislators in every state and their staff members make a whole lot more than that each. As, does our Congressional members and Senate members and each of their staffs. And much of that time in between. In 1995 our President was a Democrat – with a Republican Congress. In 2002 our President was Republican. In 2006 our President was Republican and most states were run by conservative Republican rulers. And, in 2009 – despite getting a President that is a Democrat – the majority of state governors and state administrations and state legislatures were Republican. Republicans. and by conservatives and right wing politicians. Nope, just the moral minority who have sponsored and highly paid Rush Limbaugh and various other loudmouthed obnoxious right wing operatives. And, then it turns out – the Republicans weren’t even personally moral, either – among the “moral right wing minority” that have been running the country into the ground all this time. Even once, they couldn’t keep it in their pants when it came right down to it – and the vast array of unethical, illegal, morally bankrupt crap that has gone on in their administrations will fill history books for ages to come. And, then the Wall Street debacle. And, then it turns out that no one is actually making the money they thought they were making because it damn near won’t buy anywhere close to what it could buy thirty years ago, or twenty years ago or even, ten years ago. The Labor Department still estimates that only 58% of our employable workforce is employed – and that doesn’t include the one-third of our US population that is in jail, prison, incarcerated in some damn program or in some institution. So – what is wrong with this picture? But, that didn’t stop the House of Republicans from deciding that we are too broke to help with domestic spending but not too broke to send $10 billion dollars and more out of the country to provide “economic development” to other countries. Not for our businesses doing business there. No – it is to help “jump start” their economic development and their economies. But, we’ve been doing that for over thirty years – every single year and paying for them to have infrastructure projects and development through the United Nations funds, the IMF funds, the International Development Banks and Loans and Guaranteed Loans that we backed and then wrote off and forgave – and on and on and on and on. It has been obscene. Why should it be that way now that our nation is the one suffering economic blight? 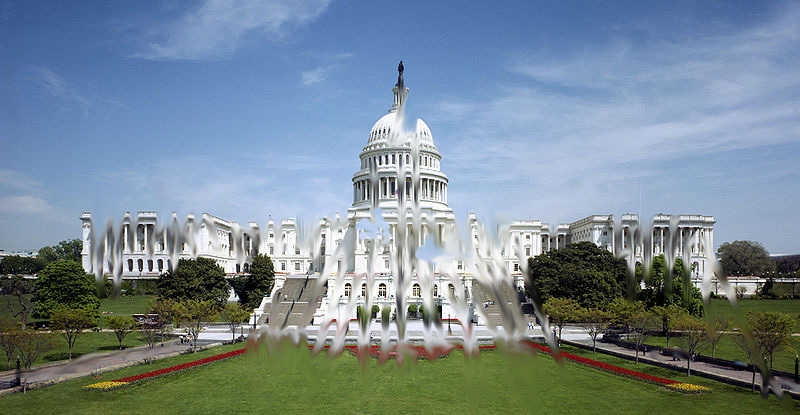 Watching the Republicans gut the Congress and our national budget to suit themselves inspired this morphed representation for what they’ve done to it. And, for what the Republican Party has done to our money, our employment opportunities, the gutting of our businesses, the driving of our national businesses and industries into bankruptcy and millions of other assaults on the American people – that is exactly what they’ve done over thirty years.